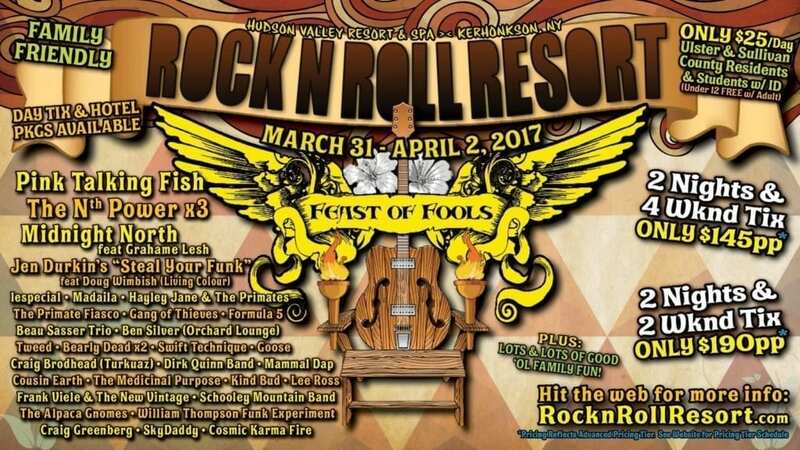 Rock n Roll Resort is coming back to the Hudson Valley Resort in Kerhonkson, NY March 31st through April 2nd, 2017. This is a unique Catskill Mountain resort-based concert experience that has taken place annually going back seven years. This year’s lineup features bands like The Nth Power and Pink Talking Fish among the initial artist announcements, with more to come down the line. The event hosts an average of one thousand fans each year. We have word that the Hudson Valley Resort, the hotel that will be the event’s home base, is undergoing renovations that’ll maintain its reputation as one of the premier events of its kind in the U.S. With access to resort amenities like a spa, swimming pools and golf, hotel rooms plus dozens of bands all under one roof, plus affordable packages to access all of the goodies, it’s a tough experience to match. We have attended resort in the past and it is a super fun time. Additionally, and with a touch of sadness- it is the last place where Demse Zullo performed before his tragic accident in his project Demse vs the Machines. We remember Zullo fondly as the band leader, producer and drummer for the Alchemystics and his faithful friend Force will be coming to the resort this year to do his magical sit in frenzy. Personally we found the resort to be almost a private party for your closest cadre of live music friends- where you don’t have to worry about the weather, you don’t have to worry about driving, everything is provided for you under one roof- and there is plenty of festival spirit alongside some cool amenities that only a resort can provide. Pink Talking Fish (PTF) will also treat guests to an extended two hour set. PTF is a hybrid tribute fusion act that takes music from three of the world’s most beloved bands. For anyone partial to the sounds of Pink Floyd, Talking Heads or Phish, PTF will hit that nostalgic sweet spot and simultaneously rev fans up through a truly unique and special concert experience. PTF’s prowess is known to anyone who’s had the pleasure of seeing them- they are not to be missed. Additional artist highlights include Beau Sasser Trio, Formula 5, Madaila, The Primate Fiasco, Gang of Thieves, Cousin Earth, and Goose. Ben Silver, founding member of Chicago house-collective ‘Orchard Lounge’ has also been confirmed for a special late-night VIP ‘Lounge Set’, plus more acts, special guests and roaming artists to be announced. “We’re on our seventh year, and we’ve really fine-tuned things more and more with each successive event. Last year’s ‘Low Key’ event showed us how much our guests truly care about the family atmosphere and the intimate environment. It’s absolutely about the music, but rekindling with your peers seems to be how our guests truly want to start off the festival season. Rock n Roll Resort isn’t a festival, and we never had a playbook for ‘Throwing an indoor resort-party,'” said Shannon Plaquet, event founder and organizer. Room info and packages, additional artist announcements, activities, directions and all event info can be found at RocknRollResort.com.